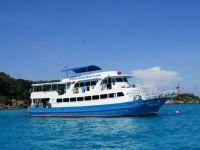 Sailing from Khao Lak, Similan Explorer is among the most popular liveaboard diving boats. The dive centre, and boat staff & crew are experienced, professional & friendly. 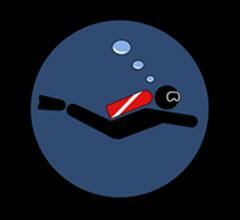 Each trip is organised to maximize enjoyment while ensuring that divers are safe and comfortable at all times. While aiming at the budget end of the market, this boat is still very comfortable and each cabin is air conditioned. 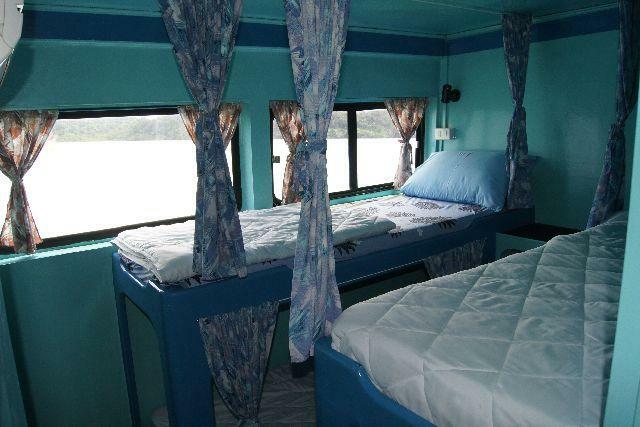 On the boat's upper deck there are two double-bed cabins, which have the best views of the surrounding scenery. 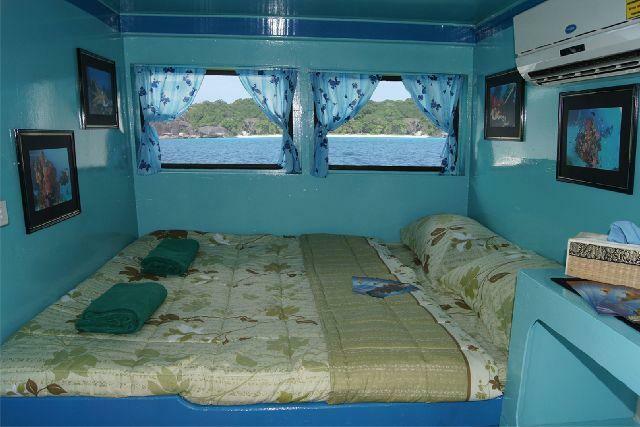 On Similan Explorer's main deck there are two cabins which have four bunk beds. These cabins are perfect for groups and families, as well as solo divers who want the very best value Similan diving liveaboard trips. Each bed has a privacy curtain, a reading light and a plug socket. Also on the main deck are four twin cabins. 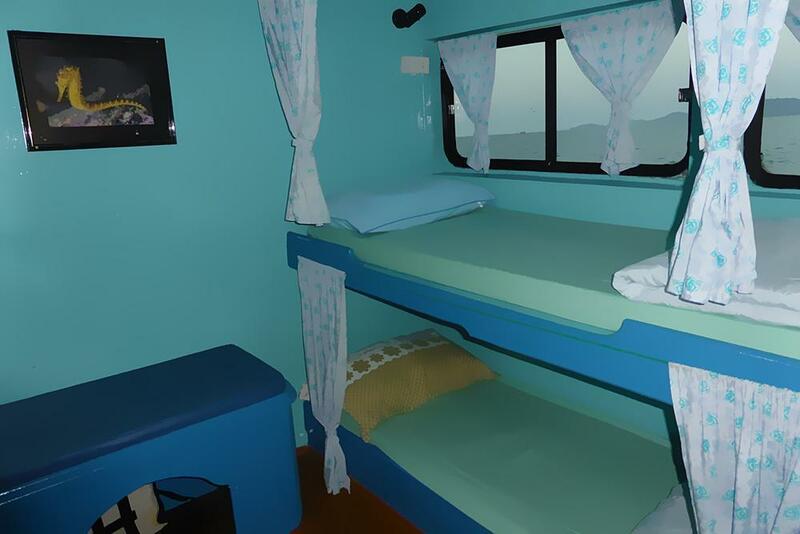 All the cabins on Similan Explorer are clean & air-conditioned, and have windows. The local and western food is served throughout the day and there are snacks and fruits always available. Diving is hungry work, but Similan Explorer divers never go hungry. The kitchen staff pride themselves on providing delicious food, always with a vegetarian option. Special dietary needs can be catered for with prior notice. 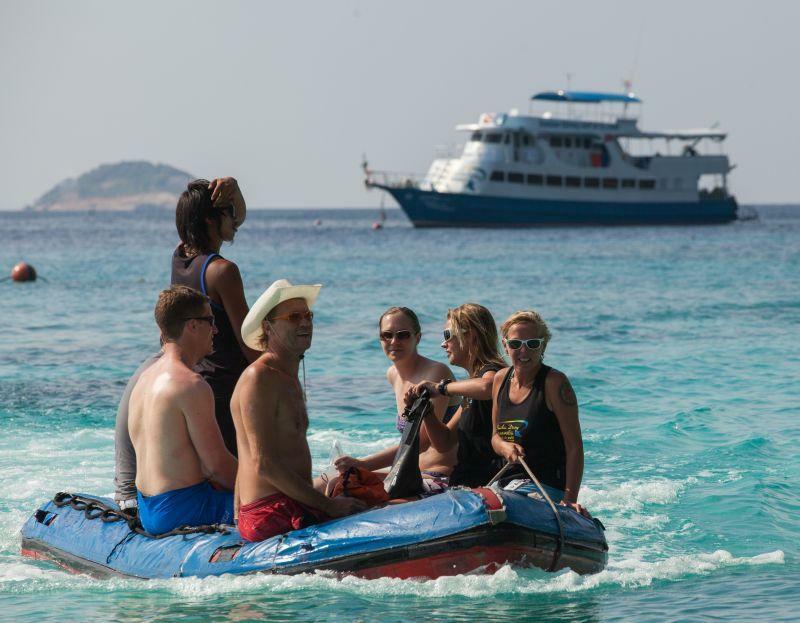 Most of Similan Explorer’s diving cruises are 5 days & nights in length with 18 dives, but a few times during the Similan diving season, the boat sails for 3 days & nights (10 dives). Non-diving guests are more than welcome, and they receive a 20% discount. The large communal dining area is where most socializing takes place on Similan Explorer, but there are hideaway spots, too. The diving platform is large and well designed, ensuring that divers can slip on the equipment and enter the water without fuss. 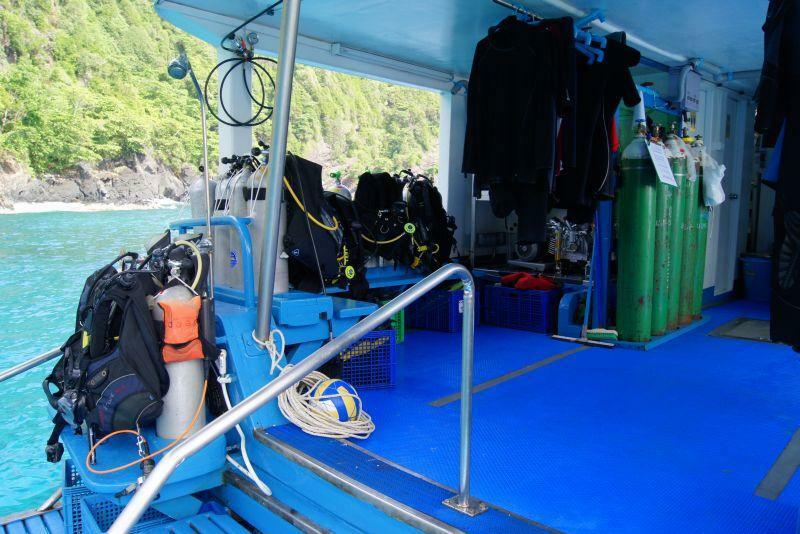 Like almost all liveaboard trips and boats, the guests’ equipment is set up just once and usually stored in the same slot between every dive. Nitrox is available at competitive rates. There is a good selection of PADI courses which can be completed on board, and this is the best (and often cheapest) way to improve your diving certification. Finally, the equipment rental on Similan Explorer is among the cheapest of all our boats, but that in no way means it’s inferior. The dive centre team pride themselves on high-quality, good-condition diving gear for the comfort, safety & enjoyment of each diving guest. This includes the use of snorkel gear, wetsuits and open-heel booty fins for free. 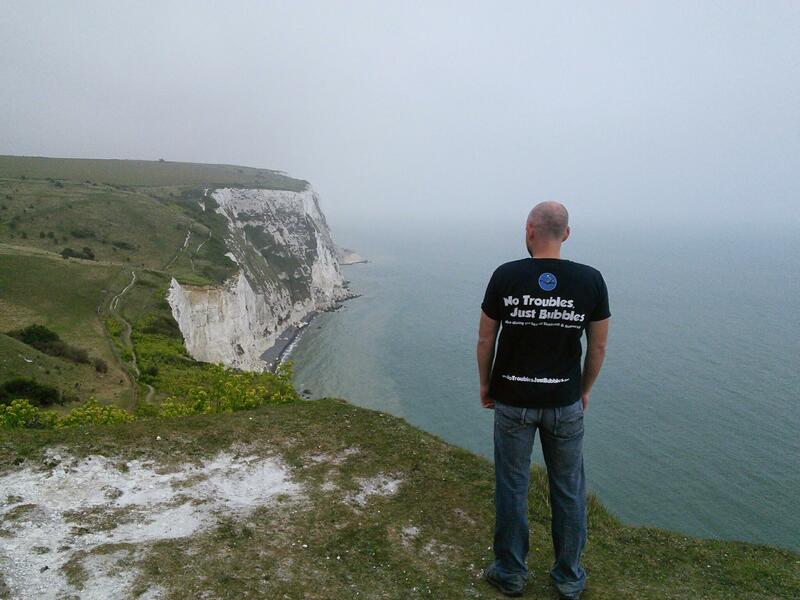 And the team supply biodegradeable toiletries (soap/shampoo etc) to ensure that the environment doesn't suffer. Guests staying in Khao Lak & Bang Niang can request a free transfer from most hotels. Arrive at the dive centre before 3.00pm for the 'check in' process of completing a little paperwork, paying the trip balance and national park fees, and maybe fitting rental equipment. Departure is in the early evening, with dinner served on board while the boat sails into the sunset. Similan Explorer gets back mid afternoon on the final day of the trip. 2. Deck Showers. 16. Double-bed Guest Cabins. 5. Main Stairs To The Upper Deck. 19. Oxygen Station. 9. 4 Bunk Guest Cabins. 23. Fire Extinguisher. 12. Bench. 26. Twin-bunk Guest Cabins. 14. Stairs From Upper Deck To Sundeck. 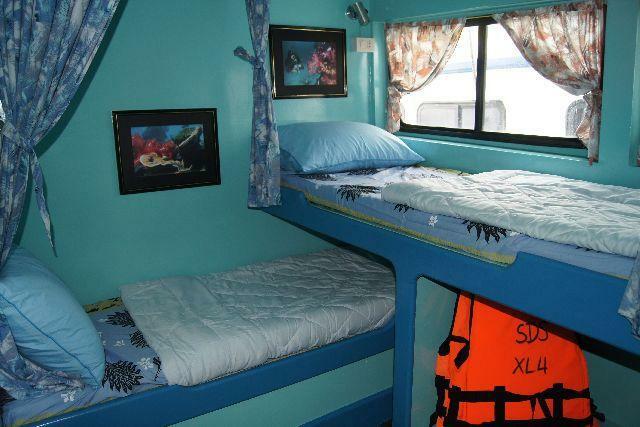 There are a few options for PADI diving courses aboard MV Similan Explorer. The two most popular courses are Advanced Open Water & Nitrox Enriched Air, but these are not the only courses available. Starting at the lower level of learning to dive, there is the Open Water Diver course on one of the best value diving liveaboard cruises in the Similan Islands. 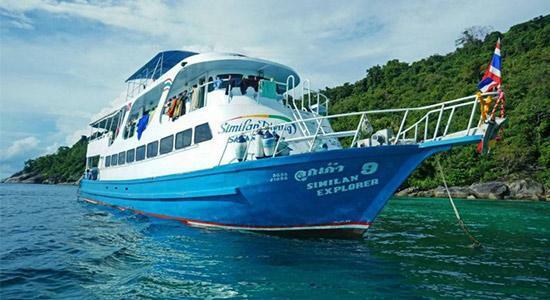 Anyone planning to take part in an Open Water course on MV Similan Explorer needs to be in Khao Lak one full day before departure, so that they can complete the theory lessons, videos & tests and practise the skills and communication methods in the pool. 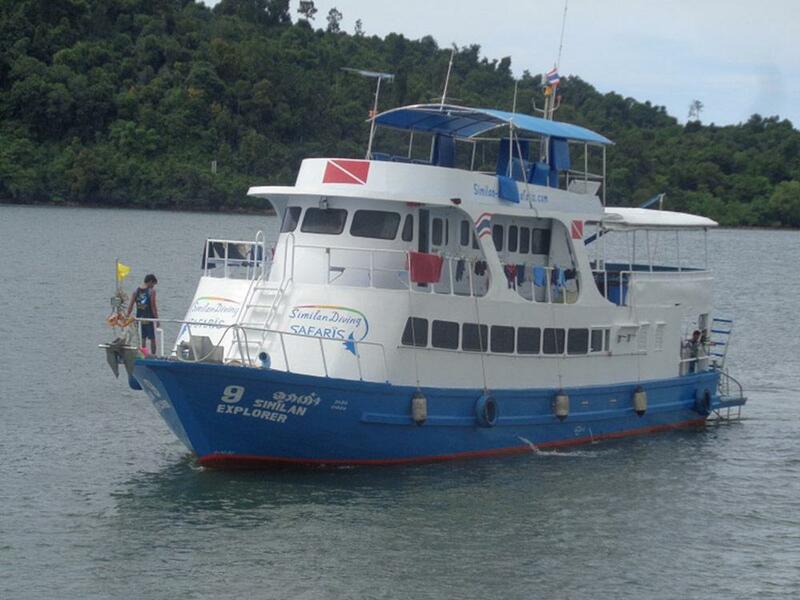 Then, once aboard the boat, they will enjoy the whole cruise and all dives with a PADI dive instructor. Normally, students only get an instructor for the first four dives, and are then passed on to a Divemaster for fun dives after that. 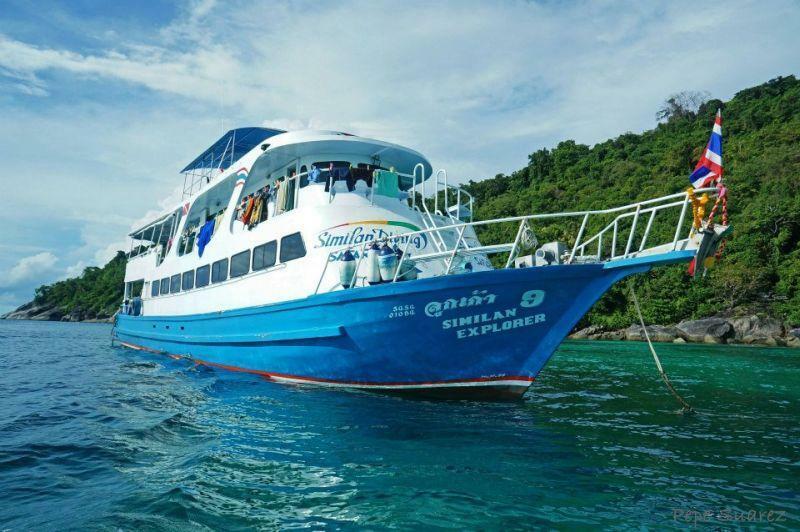 On Similan Explorer they get 17 dives, meals & air conditioned accommodation, materials and certification all also included in the listed price. 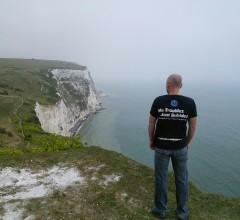 Advanced courses are extremely popular aboard scuba diving safaris. 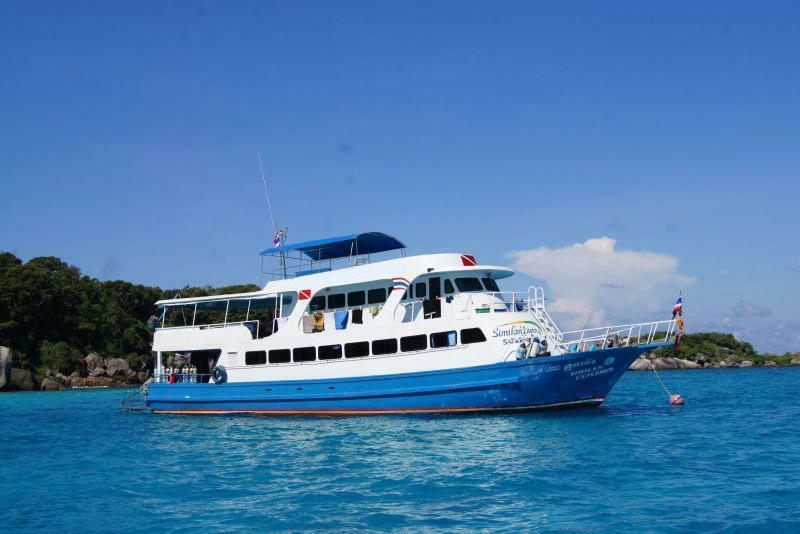 On Similan Explorer, you get the use of a dive computer for the whole of the cruise. Of course, the manuals and certifications are included too. This course is not as focussed on theory as the Open Water course is, and it allows divers to choose certain specialities and dive to depths of 30 metres. As part of the liveaboard trip, it is fantastic value. Nitrox (Enriched Air) diving is one of the most popular courses to take on diving safaris, mainly because of the opportunities to stay deeper for longer periods at The Similan Islands. On Similan Explorer divers get four free tanks of Nitrox to practise what they have learned, plus there are several options for further tank fills. The manual, certification and a Nitrox computer are all included in the great-value price. Guests staying in Khao Lak and Bang Niang can request free transfers on deaprture day. Similan Explorer Liveaboard guests should arrive for check in, final payment and equipment check at the PADI 5-star dive centre no later than 3pm on the day of departure, but they are more than welcome to do so on any day beforehand. Experienced operator with experienced staff. Good Value for money. Non-diving guests receive a 20% discount on the cruise price and reduced marine park fees. Marine park entry & diving fees are 2,000 THB for 5D/5N trips, and 1,600 THB for 3D/3N trips. Payments on board must be in cash. Payments at the office can be made in cash or with a card, but card payments incur a small surcharge.